Did the Irish Come from Spain? Most of us have heard, at one time or another, that Ireland was peopled in remote times by settlers from Spain. These settlers, the ancestors of the Irish people of today, are often referred to as ‘Milesians’. Archaeologists have found no convincing evidence for any such ancient migration, but the persistence of the idea that there was one has left the impression that ‘there must be something in it’. But what does this ‘something’ amount to? The best way to assess traditions of this kind is by working out how far back they go, and what their sources seem to be. We can begin by looking at the most important treatise on Irish origins to be composed during the Middle Ages, Lebor Gabála [Book of Invasions]. There are many versions of Lebor Gabála, all of which seem to derive from an original text written in the second half of the eleventh century. In spite of several significant differences between these versions, there is broad agreement concerning the underlying story. The Gaelic people of Ireland originated in the ancient region of Scythia—roughly corresponding with southern Russia—and perhaps imagined by medieval scholars to have some connection with Scoti, a Latin term for the Irish. They dwelt for a time in Egypt, then wandered for many years, and at last conquered Spain. Here one of them, named Bregon, built a lofty tower. One day Bregon’s son Íth climbed the tower, looked out across the sea, and saw Ireland in the distance. (Lest this seem too implausible, we are told that it took place on a winter evening, ‘for a man’s eyesight is best on a clear winter evening’.) Íth at once embarked for the mysterious island. There he met the country’s three kings, men of the Túatha Dé Danann (the old gods of the Irish, but reinterpreted in Lebor Gabála as a race of wizards from ‘the northern islands of the world’). Íth’s ability to judge justly filled the kings with jealousy, and they had him killed; his followers brought his body back to Spain. It was to avenge this deed that the Gaelic invasion took place: the expedition was led by Íth’s kinsmen, the sons of Míl Espáine (hence ‘Milesians’). Aided by the wisdom and magic of their master-poet Amairgen, the sons of Míl gained the support of Ireland’s three goddess-queens, and conquered the Túatha Dé Danann. Ireland was divided between Éremón, son of Míl, who ruled its northern half, and Éber Find, son of Míl, in the south. The druids must have had stories about the settlement of Ireland, and it seems likely that what Lebor Gabála relates concerning the death of Íth, and the exploits of Amairgen, can be seen as some kind of reflection of these lost myths. But what about the ‘Spanish connection’, and the sons of Míl Espáine? Even if there were no other reasons for being sceptical concerning a migration from Spain, these parts of the legend show many signs of being relatively late and artificial constructions. The evidence for this comes clearly into view when we delve a little deeper, and look at accounts of Gaelic origins which are even earlier than Lebor Gabála. Curiously, the oldest systematic description of Irish origins is found not in an Irish source, but in a Welsh text written in Latin: the History of the Britons, composed early in the ninth century. 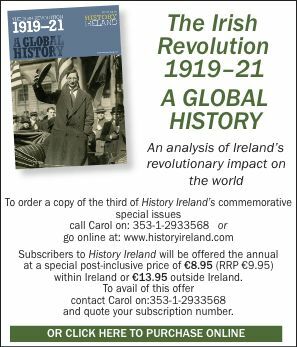 In fact, the History’s author gives us two accounts: one is a list of the different groups who came to Ireland, culminating with the Gaels; while the other is a more extended explanation of the background and early history of the Gaels themselves. They spied a glass tower in the middle of the sea, and they spied people up on the tower, and they endeavoured to speak with them, but none would respond. So for one year they hastened to attack the tower with all of their keels and all of their women, except for one keel, which was destroyed by shipwreck, in which were thirty men, and an equal number of women. The other ships sailed to attack the tower, and, while all landed on the beach that was around the tower, the sea covered them, and they were overwhelmed, and not a single one of them escaped. From the crew of that ship that was left behind because of shipwreck, all Ireland was populated to this day. And afterwards, little by little, they came from parts of Spain and held very many regions. There can be little doubt that the sons of the Spanish soldier, the miles Hispaniae, are the forerunners of the sons of Míl Espáine in Lebor Gabála. Recognising this has immediate, and fairly obvious, implications for the story in which the latter are the principal actors. If their father’s name (with its built-in allusion to the doctrine of Spanish origins) is not originally Celtic, but rather just an Irish version of a Latin phrase, then the sons of Míl themselves seem much likelier to be the creations of medieval scholars than the heroes of a primordial tradition. they came to the Altars of the Philistines and across the Salt Lake, and they went between Rusicada and the mountains of Azaria, and they came by the river Malva, and they crossed through Mauretania and the Pillars of Hercules, and they sailed the Tyrrhene Sea, and they arrived in Spain, and lived there for many years. From Spain they eventually set sail for Ireland. Speaking of this same city of Brigantia a little earlier in the same book, Orosius described it as containing a ‘most high tower’, erected ‘to keep watch on Britain’. Orosius was himself a native of Galicia, and his account of the tower in Brigantia or Brigantium (modern Coruña) probably reflects first-hand knowledge. At any rate, there can be no doubt that this is the source of the ‘tower of Bregon’ in Lebor Gabála: not a monument erected by the ancestors of the Gaels in prehistoric times, but a Roman lighthouse—still standing—for whose existence there is no evidence earlier than the third century AD. Orosius does not actually make the claim that Ireland is visible from the tower’s summit; but it would not have taken too much imagination to extract this idea from his statements that the nearer parts of Ireland ‘look toward it’ across the sea, and that it was built as a look-out point for keeping watch in the direction of Britain. There is at least one more unmistakable indication of the dependence of the Irish sources on Orosius: the repeated statements in Lebor Gabála that various groups of settlers first landed in the mysterious ‘Scéne estuary’ goes back to Orosius’s assertion, a little further along in the passage cited above, that ‘the mouth of the river Scena’ is the part of Ireland which is nearest to Spain. In several ways, then, the story of Ireland’s settlement from Spain can be shown to have been based not on native tradition but on scholarly speculation, drawing on Latin learning and especially on the writings of Orosius. But is that necessarily the end of story? Might it not be possible to argue that the artificial accounts in Lebor Gabála and the History of the Britons have replaced older, indigenous, legends of a Spanish origin? If there wasn’t ‘something in it’ in the first place, why should such stories exist at all? It is never easy to refute theories which rely primarily on non-existent evidence. How can we prove that there weren’t ancient traditions of a migration from Spain, all direct memory of which has been lost? Obviously, we cannot. But if it can be shown that the idea of Spanish origins can be explained equally well without invoking such a hypothesis, then the scenario looks much less likely. In fact there are several such explanations, all of which may give us parts of the total picture. One of these explanations can be illustrated with Orosius’s statement, patently incorrect, that Ireland ‘is located between Britain and Spain’. Wherever this notion came from, it did not originate with him: Julius Caesar had already written in the first century BC that one side of Britain ‘tends toward Spain, and the setting sun; on this side is Ireland’. One and a half centuries later, the Roman historian Tacitus likewise thought that Ireland was ‘located midway between Britain and Spain’. He too toyed with the idea of migrations from Spain, in this case as a way of accounting for the dark colouring and curly hair of the tribe of the Silures in southern Wales. If Spain was thought to be the part of Europe closest to Ireland, what would be more natural than to see it as the source of arrivals from overseas? Already in 1915 the Dutch scholar A.G. van Hamel had concluded that practically ‘the entire story’ of the sons of Míl can be accounted for on the basis of the geographical ideas of Orosius. But there are at least two other considerations which seem worth taking into account. One has to do with names. At least as early as the time of the Spanish scholar-bishop Isidore of Seville (d. AD 636), it was thought that Hibernia, the Latin name for Ireland, derived from (H)iberia, the Latin name for the peninsula containing Spain and Portugal. (In support of this etymology, Isidore echoes Orosius’s words about the nearness of Ireland to Spain.) In fact, any real connection between the two names seems highly unlikely. The b in Hibernia does not really belong there: this is a Latinisation of a Celtic name better preserved in the Greek form Ierne, and seems to go back to something like Iweriu [Fertile Land] (compare Old Irish Ériu, Modern Irish Éire). The adaptation was evidently suggested by the Latin adjective hibernus [wintry] and reflects a much less favourable view of the national climate than that which lies behind the name in its original form. But even if the resemblance between the two Latin names is only a coincidence, it is certainly a striking one. An Irish scholar, reading in the pages of Isidore that Ireland’s name had come from Spain, could easily have concluded that its people probably came from there as well. That Irish scholars did have access to Isidore, and to other Spanish writers as well, is the last point to be considered in this connection. The seventh century was a time of intense and creative intellectual activity in Ireland, of a dynamic synthesis of native and imported concepts and traditions which was fundamental to the evolution of Gaelic culture. At just this time, links with Spain seem to have been close and important: not just the writings of Isidore, but other learned works as well, found their way from Spain to Ireland and played a key role in shaping the world-view of the monastic men of letters. At a time when scholars in Ireland felt themselves to be receiving so much from Spain, not least in the fields of chronology and world history, it is not at all surprising that Spain—’the mother of races’, as Isidore had called it—should figure prominently in their own historical speculations. A thousand years later it was politics, religion, and the troubled intersection of the two which were the main reasons for the links between Ireland and Spain. But the idea of an ancient kinship between the two lands must still have played a part in fostering such links. It may have been with a view to strengthening this connection even further that the contemporary historian Geoffrey Keating, for example, argued that Spain and Ireland had been in close contact since long before the time of Íth. As we have seen, the story of the ‘Milesians’ goes back a long way. But it is important to recognise that it was an old invention, the fruit of medieval imagination, rather than a dim recollection of the prehistoric past. John Carey lectures in the Department of Early and Medieval Irish at University College Cork. J.T. Koch & J. Carey (eds. ), The Celtic Heroic Age: Literary Sources for Ancient Celtic Europe and Early Ireland and Wales [Translations of Lebor Gabála and the Irish section of the History of the Britons] (Andover & Aberystwyth 2000). R. Baumgarten, ‘The geographical orientation of Ireland in Isidore and Orosius’, in Peritia iii (1984). J. Carey, The Irish National Origin-Legend: Synthetic Pseudohistory, Quiggin Pamphlets on the Sources of Medieval Gaelic History 1 (Cambridge 1994). J. Carey, ‘Native elements in Irish pseudohistory’, in D. Edel (ed. ), Cultural Identity and Cultural Integration: Ireland and Europe in the Early Middle Ages (Dublin 1995). Digital images of the Book of Leinster can be viewed on the Irish Script on Screen web site (www.isos.dcu.ie).